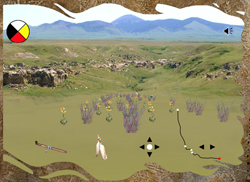 Narcisse examines a petroglyph that he believes is representative of the landscape around Sweet Grass Hills. 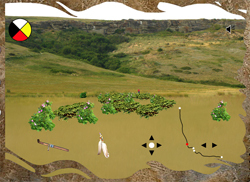 Bonnie points out a section of the image that might represent caves. There is some ochre on the image, which is easiest to view through polarized sun glasses. Narcisse points out the Thunderbird Cave. In the Thunderbird Cave are bundles left as offerings. The drawing of the Thunderbird is one of many depictions within the cave. 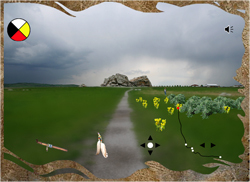 Narcisse describes the Vision Quest site across from Writing on Stone. People have started going back there for Vision Quests and there are offerings at that site as well. Gerald discusses how to best choose a place to establish a trading post. It is important to select a place where many people come, such as the old trails where people walked from one point to the next. Belly River Crossing is the shallow part of the Belly River, where people were able to cross. This helps Gerald and his wife determine where the Old North Trail used to run. 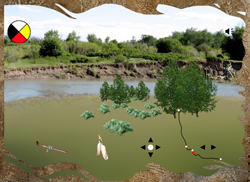 Early forts were put right where the trails crossed important rivers. Marvin describes where the Old North Trail used to run, all the way up to Rocky Mountain House. There are lots of water sources along the Old North Trail. On the open plains, the land is more rugged and there are fewer water sources, making it harder to travel on. Marvin gives the history of Stand Off, Alberta. In around 1868-1875 the area around Stand Off was big in whiskey trade. Joe Kipp, a Mandan Indian from Fort Benton, was running from US Marshals bring whiskey over. When approached by the US Marshals at "Whiskey Gap", Kipp defended his whiskey and told them they should be ready for a fight, a "stand off." Following this event several whiskey posts were set up in this area, including the first post named "Fort Stand Off." Gerald discusses the importance of Belly Buttes as a landmark. 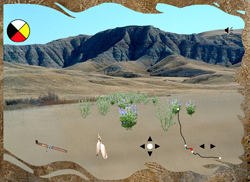 Places like Belly Buttes were used to navigate on the flat prairie. For people traveling north from the present US-Canada border, Belly Buttes was a key landmark. At Head-Smashed-In you meet Carolla Calfrobe and Stan Knowlton, a Park Interpreter. Carolla shares with you that there were four tribes from the Blackfoot Confederacy who used this area. She also describes how different types of berries in the area are collected and used. Chokecherries are dried, and then stored to be used through the winter. The bark can be used for medicinal purposes. Juniper berries are used for smudging. Stan explains the importance of the site. There are many other jumps located in the area, but Head Smashed In is the most important. It is estimated that 85% of sites are salvage operations; sites that have been found prior to construction. Lots of cultural pieces are lost when this happens. Head Smashed In was not a salvage site, but was carefully planned. Narcisse then tells the story of Napi and the Big Rock, among others. Narcisse explains the difference between Writing on Stone and Okotoks. At Writing on Stone they carved into the rock, because it was sandstone. At the Big Rock, they drew in Ochre because that rock is Granite and too hard to carve images into.